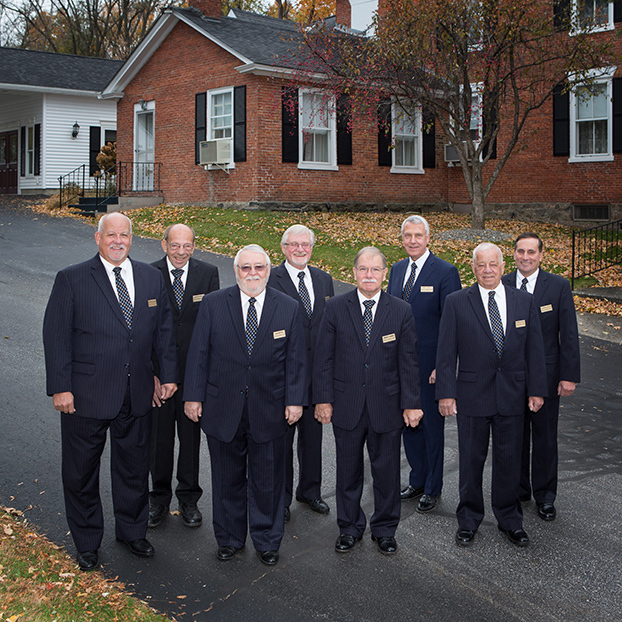 Staff members of Heald Funeral Home are caring and experienced professionals who understand that each family is unique and has personal requests and traditions. These requests and traditions are of utmost importance to our staff of licensed funeral directors. Raymond, better known as Rett, is President of the Heald Funeral Home. He graduated in 1979 from Hudson Valley Mortuary College in Troy, New York and became a licensed Funeral Director and Embalmer shortly thereafter. He is the son of Howard G. “Bud” Heald, and a fourth-generation Heald in funeral service in St. Albans. He is married to Emily (Paquin) and they have two children, Christopher, a graduate of Southern New Hampshire University, who is currently a CPA with Kittell, Brannigan and Sargent and Meghan, a graduate of the University of Vermont, who is a teacher at Highgate Elementary School. Rett has served as President of the Vermont Funeral Directors Association and presently serves on the D-Mort Disaster Team for New England, which is responsible for identifying remains and assisting bereaved families at times of disaster. In this capacity he assisted at the “Egypt Air Crash” and the World Trade Center Attack. Rett is an avid outdoorsman and enjoys hunting and sugaring. He has completely remodeled his home and is quite accomplished with woodworking and carpentry. He is a member of the “Call Force” for the St. Albans City Fire Department. He is Treasurer for the St. Albans Cemetery Association. Rett’s expertise, experience, and compassion will serve you well when it is your responsibility to see that someone dear to you has a fitting memorial. Lucien is the former owner of the Hayes-Rich Funeral Home in Fairfax which he sold in 1999. He recently came back into funeral service and is assisting us and other colleagues with whom he has remained associated. Lucien is a Graduate of New England Institute of Mortuary Science and is fully licensed in Vermont and New Hampshire. We welcome his expertise and assistance in our operation. A resident of Fairfax, he is a member of the Fairfax Fire Department and the Fairfax Planning Commission. He is also a member of the Region 1 DMORT team and was recently deployed to assist in the Mississippi area following hurricane Katrina. Bob grew up in Southern Vermont and was a graduate of the Albany Campus of Russell Sage College and New England Institute in Boston. His family has been in funeral service since 1915 and, following graduation from college, Bob returned home to assume operation of the family business in Wilmington. In 1984, Bob and his wife, Kathie, acquired funeral homes in Bennington, Arlington and Manchester, Vermont, operating them until 2003. In 2004, Bob moved to Underhill and began working with the Heald Funeral Home on a part time basis as a licensed funeral director and embalmer. Bob and Kathie have three grown children, Mark, Jeremy and Erin and a grandson, Isaiah. He is a member of the National Funeral Directors Association, Past President of the Vermont Funeral Directors Association, served 5 years on the Vermont State Board of Funeral Service and is a former member of the Selected Independent Funeral Homes, National Disaster Mortuary Service - DMORT Region 1 and the Vermont Army National Guard. He attends the United Church of Underhill. Bob enjoys golf, walking and spending time with his grandson. He was formerly a licensed pilot and still enjoys all types of aviation. Emily is the wife of Rett and works full time at the Northwestern Medical Center. She is now responsible for the daily business of the funeral home. Stan joined us in 1997 when he retired from IBM in Essex Junction as a second-level manager. While at IBM, he traveled extensively throughout Europe and the United States. He graduated from Bellows Free Academy in St. Albans in 1960 and served in the U. S. Army from 1960 to 1963. He and his wife, Sandy (Thomas) live on French Hill in St. Albans. Their five children, Shari, Tom, twins, Jerry and Gary, Stephanie are all young adults now, and have seventeen children. Stan and Sandy were very active in their sporting events, especially hockey, when their children were growing up. Much of Stan’s spare time is spent building their new home, a craft at which he excels. Stan is known and liked by everyone, and enjoys people. This makes him a very valuable member of our team. Orginally from Ferrisburg, where he was elected to two terms in the Vermont House of Representavies. Employment brought Jim and his family to St. Albans, where he managed the Manard Auto Supply Store for the next 35 years. Jim and Daisy purchased a home in Fairfax in 1972, where they still reside. During the years since coming to this area, Jim has been active in our communities including: Vermont Maple Festival Committee, St. Albans Chamber of Commerce Board of Directors, Assistant Scout Master with the Fairfax Boys Scout and Fairfax Volunteer Fire Department, which included 18 years as Chief and served 2 terms as President of the Franklin County Firefighters Association. Jim and Daisy have been married for 50 years and have 2 children and 4 grandchildren. Normand Choinere was born in Highgate Center in 1945. He graduated from Highgate High School in 1966. After that he attended and graduated from the Northeast School of Broadcasting in Boston. It was during the Vietnam Era, so shortly after school, Norm joined the Army and served part of his time at Fort Rucker, Alabama and then onto Vietnam. After his military service, Mr Choinere worked in New York City for Broadcasting Magazine for approximately a year. He then returned to Vietnam and worked as a photojournalist for over a year and spent six weeks as a photojounalist in the Middle East. Upon returning to Vermont, Normand worked for WPTZ-TV of Plattsburgh, New York as its Vermont reporter and weekend news anchor. In 1974, Norm bought Houghton's Store on South Main Street in St. Albans and shortly after renamed it Books and Things and later it became known as The Champlain Collection. Normand sold the custom frame portion of his business and continues to be publisher and distributor for the art of Fred Swan. Normand was married to Nancy (Thuot) Choinere who passed away on March 5, 2015. They have two children - Cynthia Murtagh of Kittery Point, ME and James Murtagh of Truckee, CA and one granddaughter, Hiliary Murtagh of Allston, MA. Norm is proud to be serving the community as an Associate at the Heald Funeral Home. A native of St. Albans and lifelong resident, he retired in 2003 after spending nearly 40 years in a local service industry. During his career, he served as President of the St. Albans Chamber of Commerce, and President of the Independent Insurance Agents of Vermont. He was involved in United Way, St. Albans Rotary Club and the American Heart Association. He presently is a volunteer in the Vermont Cancer Society Road to Recovery Program and also a mentor in SCORE, a volunteer business consulting organization. He is married to his wife, Dale and enjoys a joined family of seven and thirteen grandchildren. He joined the staff of the Heald Funeral Home on January 1, 2012. Tom was born and raised in Springfield, Massachusetts and then served for 5 years as an Operations Specialist in the United States Navy. In 1982, he was hired by the FAA, and went to their Academy in Oklahoma City. Upon graduation he started his career as an Air Traffic Controller in the Westfield Tower, Barnes Municipal Airport in Westfield Massachusetts. In 1987, he was transferred to the Burlington Vermont Tower/Approach until his retirement in January of 2013. Tom and his wife, Priscilla have been married for 28 years and have 2 daughters, Olivia, a senior at the University of Vermont and Julia, a junior at St. Michaels College. Tom is active in Fire Service, having been with the Georgia Volunteer Fire Department from 1987-1989 and been with the Fairfax Volunteer Fire Department since 2001, where presently he serves as Chief. In his spare time, Tom enjoys playing golf.